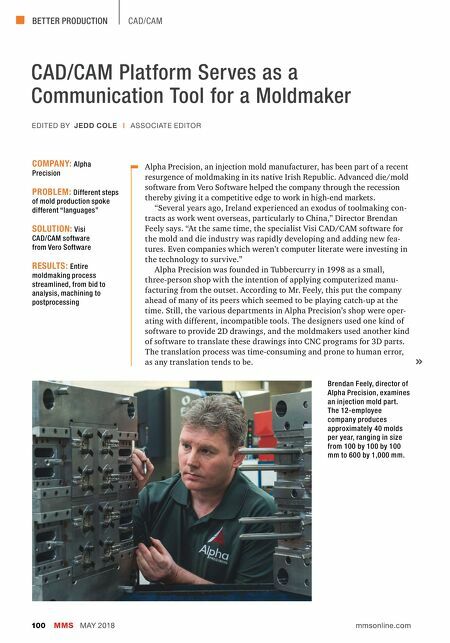 BETTER PRODUCTION MMS MAY 2018 100 mmsonline.com CAD/CAM CAD/CAM Platform Serves as a Communication Tool for a Moldmaker Alpha Precision, an injection mold manufacturer, has been part of a recent resurgence of moldmaking in its native Irish Republic. Advanced die/mold software from Vero Software helped the company through the recession thereby giving it a competitive edge to work in high-end markets. "Several years ago, Ireland experienced an exodus of toolmaking con- tracts as work went overseas, particularly to China," Director Brendan Feely says. "At the same time, the specialist Visi CAD/CAM software for the mold and die industry was rapidly developing and adding new fea- tures. Even companies which weren't computer literate were investing in the technology to survive." Alpha Precision was founded in Tubbercurry in 1998 as a small, three-person shop with the intention of applying computerized manu- facturing from the outset. According to Mr. Feely, this put the company ahead of many of its peers which seemed to be playing catch-up at the time. Still, the various departments in Alpha Precision's shop were oper- ating with different, incompatible tools. 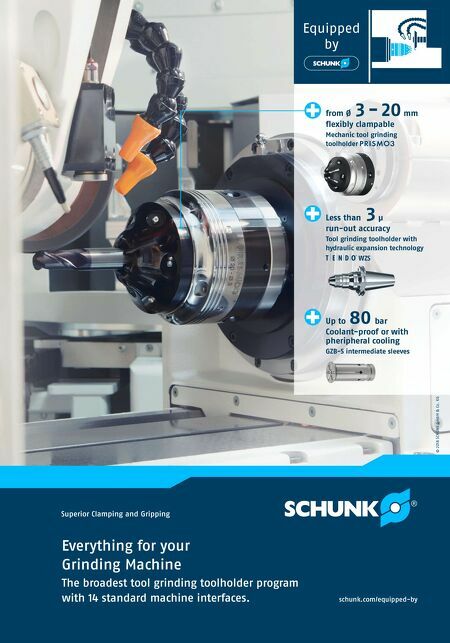 The designers used one kind of software to provide 2D drawings, and the moldmakers used another kind of software to translate these drawings into CNC programs for 3D parts. The translation process was time-consuming and prone to human error, as any translation tends to be. COMPANY: Alpha Precision PROBLEM: Different steps of mold production spoke different "languages" SOLUTION: Visi CAD/CAM software from Vero Software RESULTS: Entire moldmaking process streamlined, from bid to analysis, machining to postprocessing EDITED BY JEDD COLE | ASSOCIATE EDITOR Brendan Feely, director of Alpha Precision, examines an injection mold part. The 12-employee company produces approximately 40 molds per year, ranging in size from 100 by 100 by 100 mm to 600 by 1,000 mm.